World heavyweight champion Stipe Miocic wrote another chapter in a perfect 2016 with a successful first round knockout title defence against no.2 contender Alistair Overeem in his home city of Cleveland to bring to a close a spectacular UFC 203 fight card. Overeem circled around the Octagon, opting to conserve energy and catch the champion on the counter with his hard hitting jabs, often running from the thick of the action much to the displeasure of a raucous crowd. As Miocic closed the distance, 'Reem' stunned the hometown hero with a destructive right hand to floor the champion, however was unable to finish the fight on the ground as a resilient Miocic fought out of a guillotine choke to get back to his feet. The red corner fighter then proceeded to respond by tagging the Dutch representative with a left hook to put the challenger on his last legs. With just over thirty seconds of the opening round to go, Miocic grounded his opponent and struck with a flurry of vicious blows that prompted a stoppage late in the round. 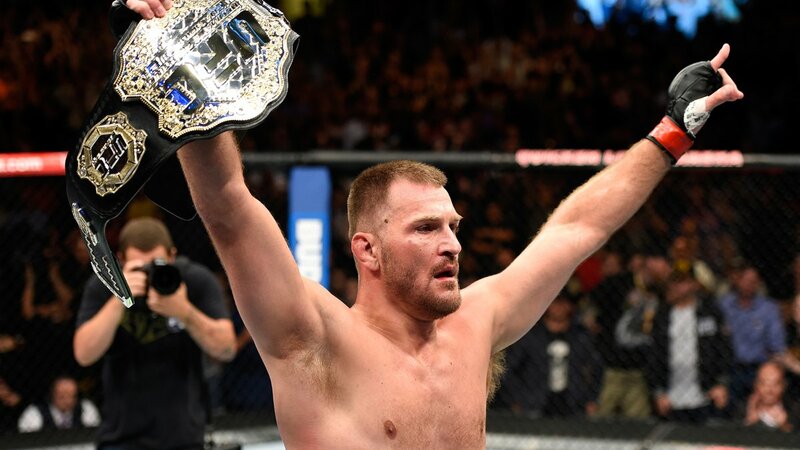 Cleveland's own Stipe Miocic had overcome a huge obstacle in his reign atop the heavyweight division to retain his billing as "baddest man on the planet". Prior to the world title showdown, former champion Fabricio Werdum began his road to another title shot with a unanimous points victory over Travis Browne. The Brazilian submission specialist dominated in a staggered first round disrupted through a stoppage for a hand injury to Browne. 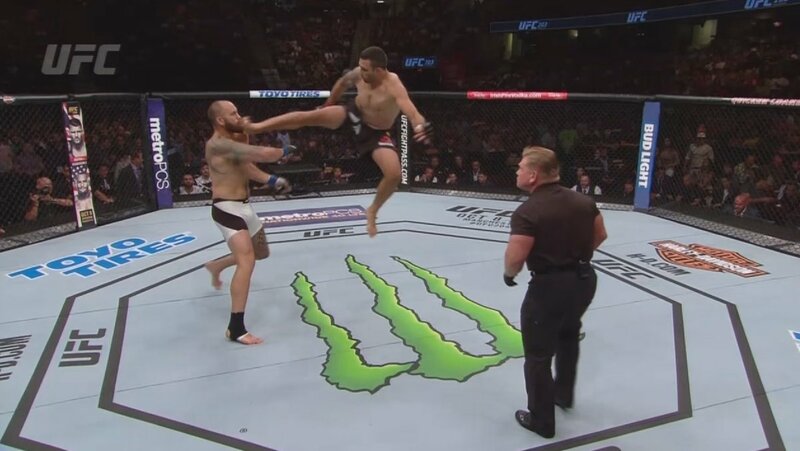 A wave of acrobatic kicks and superman punch combinations allowed Werdum to comfortably take the first round as his American opponent looked in considerable discomfort. As the dust settled from the opening five minutes, a much slower second round shaped up to be a much more even one than the opener, with Werdum landing with a jab, a bodykick and leg kick before Browne replied with couple of leg kicks of his own. Going into the final round, Browne found himself requiring a finish to claim a monumental win over a former world champion. It never happened for the 34-year-old though, as a cautious last five minutes attracted a chorus of boos from the expectant Cleveland audience, a lazy, loose set of punches as the clock winded down put a downer on a fight which began with plenty of momentum and promise. Werdum's victory was marred with controversy after the final bell though, as Browne's corner appeared to confront Werdum before the victor replied with a front kick. The win sets up another title bid for the jiu-jitsu artist, likely against the triumphant fighter from an inevitable Cain Velasquez vs Stipe Miocic battle. Elsewhere on the Cleveland card, former WWE superstar CM Punk was venturing into the unknown as he stepped into the Octagon for the first time to complete a two-year journey of transition and training. His MMA debut spectacularly flattered to deceive though, as newcomer Mickey Gall grounded the Chicago native within five seconds and proceeded to pummel the man otherwise known as Phil Brooks. A resilient Punk attempted to fight out of the firm hold but it was clear there was only going to be one winner as the gulf in class became apparent. After two minutes and 14 seconds Punk eventually succumbed to a rear-naked choke to prematurely bring a halt to one of the most intriguing bouts on the card. Earlier on, Jimmie Rivera outclassed Urijah Faber in a points victory to earn his fourth consecutive win at 135lbs while Jessica Andrade strengthened her bid for a shot at Joanna Jedredjzczyk's strawweight championship with a first round stoppage win over Scot Joanne Calderwood.